Performance is alive and well around the globe and the new 2014 Ford Fiesta ST proves that it will continue. The Fiesta ST took the Best Hot Hatch crown in Europe and is now advancing around the globe and launches in China for the first time. Ford dominated this year’s Auto Express Awards with four honors, more than any other manufacturer, and the Fiesta was awarded with two. It's good news for performance fans. The new Ford Fiesta has already made a name for itself in the UK and its popularity is reflected in the demand for the sporty hatch. Registrations in the UK rose from 96,000 new registrations in 2011 to 109,000 last year. This year is shaping up to be even better with close to 61,000 registrations reported in the first six months of the year, which is 1,500 more than the same time last year. And the hot Fiesta ST has over 2,250 more than last year. The Ford Fiesta ST is attracting many performance enthusiasts around the globe and for good reason. It starts under the hood with a new high-output variant of the advanced 1.6-liter EcoBoost four-cylinder engine, delivering some amazing numbers. The Fiesta ST hatch pumps out 134 kW (179 hp) of power, 240 Nm (177 lb ft) of torque, 0-100 km/h in 6.9 seconds, and a top speed of more than 220 km/h (136 mph). The new technology in the EcoBoost four-cylinder includes turbocharging, and the latest high-pressure direct fuel-injection and Twin-independent Variable Cam Timing. It comes coupled to a six-speed manual transmission specially developed for Fiesta ST to deliver powerful driving dynamics along with producing outstanding fuel economy. All these technologies were put to the test in over 5,000 kilometers of driving on Germany’s Nurburgring Nordschleife. Ford will now launch the new Fiesta ST in China with a price of 185,900 Yuan and is the second performance car introduced in China after the Ford Focus ST. The hot hatch will be Ford’s first three-door offering in the country and is directly inspired by the global Ford Fiesta race and rally cars currently competing on the world stage and driven by Rally Race star Ken Block. 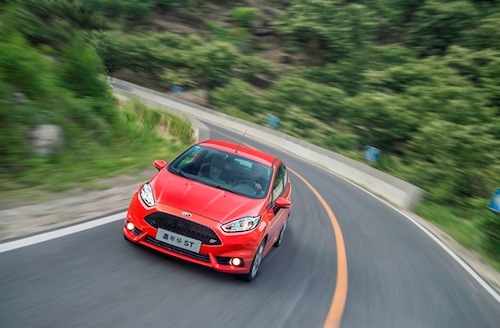 Chinese drivers will be drawn to the production Fiesta ST’s sporty and agile driving dynamics. Now the Chinese will get to experience what European customers have fallen in love with. The 2014 Ford Fiesta ST is the fastest small production car in the world is about to become a global performance car in China that produces both power, efficiency and at a reasonable price.